OUR VANS HAVE TWICE THE SPACE OF A 6 YARD BUILDERS SKIP! Only pay for the space you fill! We are much more competitively priced than hiring a skip and we do all the heavy lifting. “We’re Here To Clear” From a Bed to a Shed,You Name It We’re Clear It, Prompt Friendly Service all areas covered Domestic & Commercial Rubbish Clearance, Licensed by the Enviromental Agency. From a bed to a shed, to a full house / office clearance. Were here to clear – so why not get in touch today? Direct Waste Services are based in Tunbridge Wells and cover, Crowborough, Uckfield and surrounding areas. We are a fully insured, uniformed and licensed rubbish removal and waste clearance service. We provide environmentally-friendly disposal and provide waste removal services for homeowners, rental properties, retail, commercial busines and local authorities. 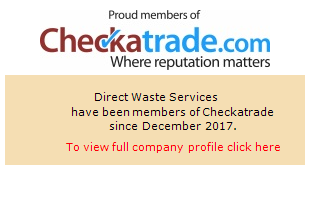 Direct Waste Services have been established for over 20 years is an established company and has an exceptional reputation in Crowbrough, Tunbridge Wells and throughout the South East. Offering cost effective waste solutions including unwanted furniture and electrical appliances through to refurbishment waste and garden refuse. We’ll clear rubbish from anywhere on your property, inside from cellar to attic or outside from front gate to the back of your back garden. Direct Waste Services operate throughout Kent and Sussex. Contact us today to see if we can help solve your waste disposal and rubbish collection problems. We’re here to clear. LOOKING FOR A CHEAPER ALTERNATIVE TO SKIP HIRE? Direct Waste Services Can help! • Direct Waste can deliver a skip bag to your property. • We deliver Skip Bags to your property within a 15 mile radius of TN6. • All you then have to do is simply fill it with all your unwanted household rubbish or garden waste. Shops • Houses • General Builders • Farms • Gardners • Carpenters Cleaners • Roofers • Kitchen Fitters • Bathroom Refurbishments • Decorators • Garden Waste • Soil • Rubble • Hot Tubs • Bulky items including Sofas, Beds and More….. Collect waste the same day,great job. I would just like to say thanks to Mark for clearing my garden out. He was on time, cleared everything and left it neat and tidy. Would 100% recommend. Just a note of thanks to Mark and his team for the quick same day response for collection of our house move packing materials. Impressed with the efficiency and quick on site work.